Beautifully engraved certificate from the Rex Typewriter Corporation issued in 1921. This historic document has an ornate border around and is hand signed by the Company's President, T. J. Rueping and Secretary and is over 84 years old. Toning and some signs wear. 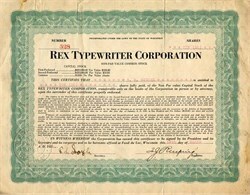 The Rex Typewriter Company made the Demountable Typewriter Company.